The last time we visited Greenwood Forest Park was back in February 2017, where upon arrival we were met with quite possibly some of the heaviest rain we had ever experienced. Not to be defeated though, we stayed and enjoyed some of the attractions they had on offer and still had an incredible time despite the bad weather. 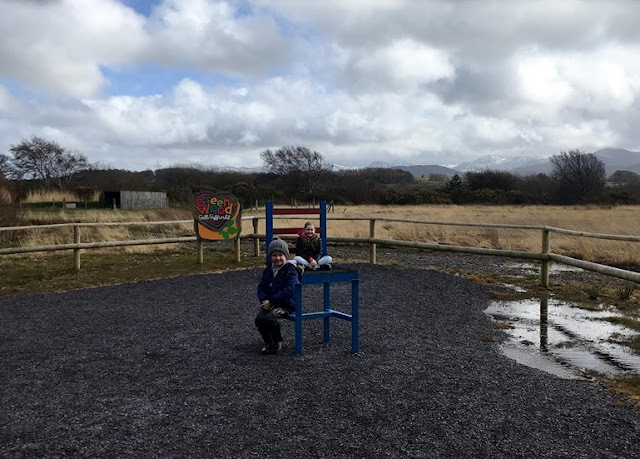 We promised the children that we would definitely return though on a sunnier day so that they could experience some of the other outdoor activities that were available and we managed to return last week just after the Easter holidays. 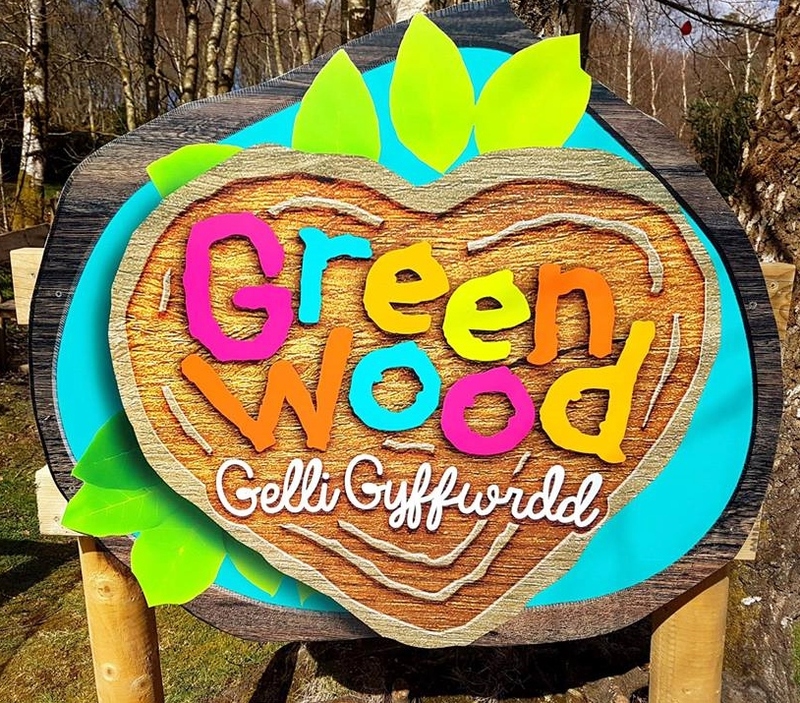 The park has gained new ownership in the form of Continuum Attractions since our last visit and so we were keen to see what changes (if any) they had made to Greenwood Forest Park, which was already a well established and much-loved environmentally friendly North Wales attraction. As per our previous visit the attraction was well signposted from the main road and very easy to find. There is a large main car park, in addition to an overflow car park opposite that provides plenty of spaces. The first change we noticed was the new bright and colourful logo, which we all agreed looked fantastic. As we made our way to the admission booths, we came across an absolutely stunning peacock that was roaming freely by the entrance. My children thought it was so beautiful and also found it really funny when it began to follow us. Having this information online is a really great idea, as it means you can plan your day and see exactly what events are available prior to your visit. You simply select the date you are visiting on the calendar and the event list will pop up. It also states whether the event or special activity is included or if there is an extra charge, so again this helps with planning if you are visiting on a budget. There were two admission booths, which meant that the queue to get in reduced very quickly. I noticed that there were different admission rates that vary, depending on whether it is low, mid or high season. During quieter periods some of the activities are unavailable or operate on a rotational basis and so the price for low and mid season costs less in order to reflect this. 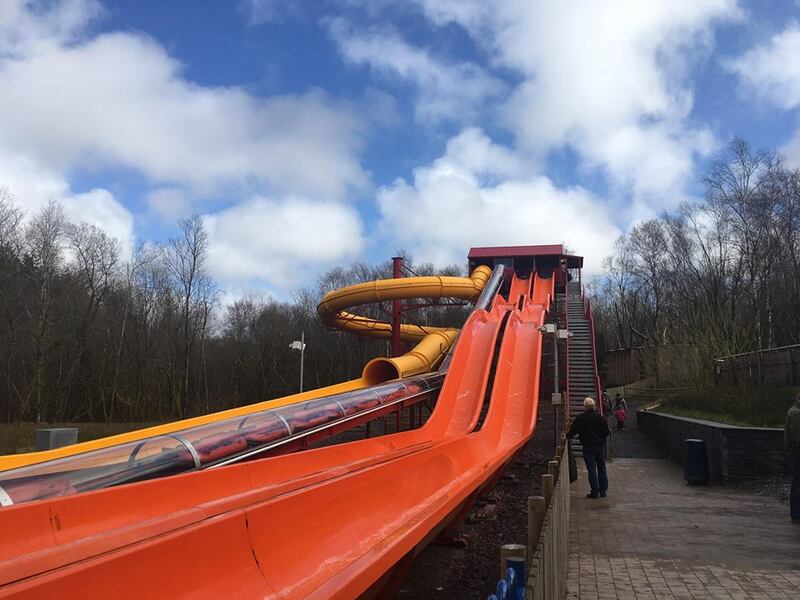 I think that this is a great idea and means that you are getting good value for money all year round, regardless of whether you visit during the quiet February half term or the peak time of the summer holidays. As we were visiting during the Easter holidays, this classed as peak time and so the entry price for an adult was £15.95 and for children aged 3-15 it was £15.40. Under 3's can enter free of charge, which I think is excellent as there is still plenty to do for the little ones. Once inside the park, my children quickly demanded that we went straight over to the Green Dragon Rollercoaster, as this had been closed on our previous visit a year earlier. This ride is actually very unique, as it is the world's only people powered rollercoaster. This environmentally friendly ride begins by you walking up a hill to the entrance of the ride, where you then enter a lift. The power that is then exerted by the lift descending, causes the rollercoaster and platform to lift up towards the top of the track. When you then exit the lift, it is another walk back to the top, to take your seats. The five car coaster can carry 20 people per ride and sets off along a 250 metre track. Reaching speeds of upto 25mph, it is so much fun and an ideal rollercoaster for young children. Once the ride comes to a stop, you alight at the bottom of the hill and the process begins again with the next group of passengers. 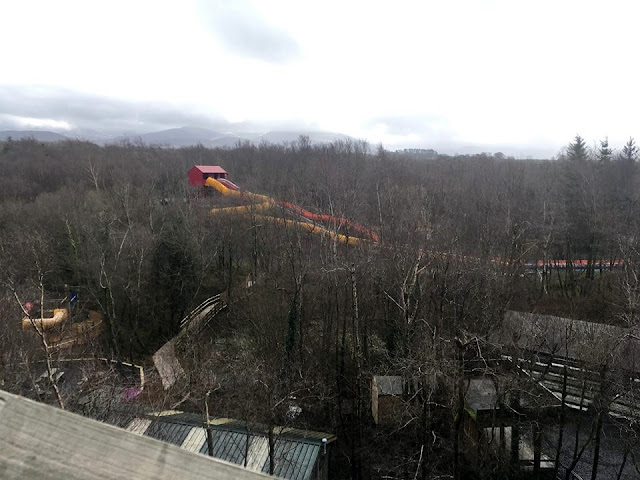 If you look carefully in the picture below, you can see the rear of the rollercoaster being lifted up through the woodland as the lift descends. After the excitement of the rollercoaster, we noticed that there was only a small queue for the archery, so we all made our way over to this sheltered area for some bow and arrow fun. 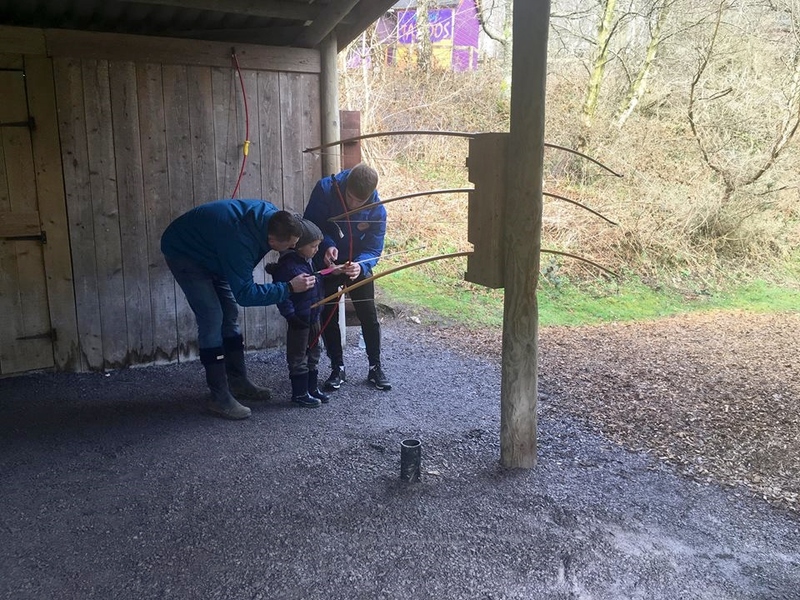 Both Emma and Ben have tried archery many times before, but this was only Riley's second time, having previously attempted it only once before on our previous visit. With the help of his dad and also the instructor, he managed to get two arrows on the board and was extremely pleased with himself. I really liked the fact that this was a covered area, as it meant that this activity can be enjoyed in all weather conditions. Next we decided to climb up to Snowdon View which is a large wooden platform, that on a sunny day boasts magnificent views of the highest mountain in Wales. Unfortunately as you can see from the photo below, it was a bit too cloudy during our visit, however it did mean that we could see something very exciting in the distance, in the form of the Solar Splash! Of course no sooner had my children spotted this, we were met with requests to go over to it immediately. Somehow I managed to convince them all to enjoy the other activities that were nearby first, before we took a walk over. Luckily they didn't need much persuasion, once they saw the Treetop Towers and disappeared off into the woodland playground. 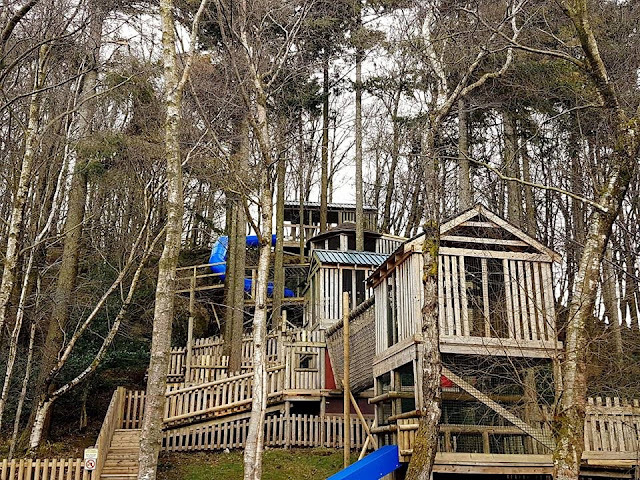 This play area is huge and features a combination of timber towers, tube slides and netted walkways. 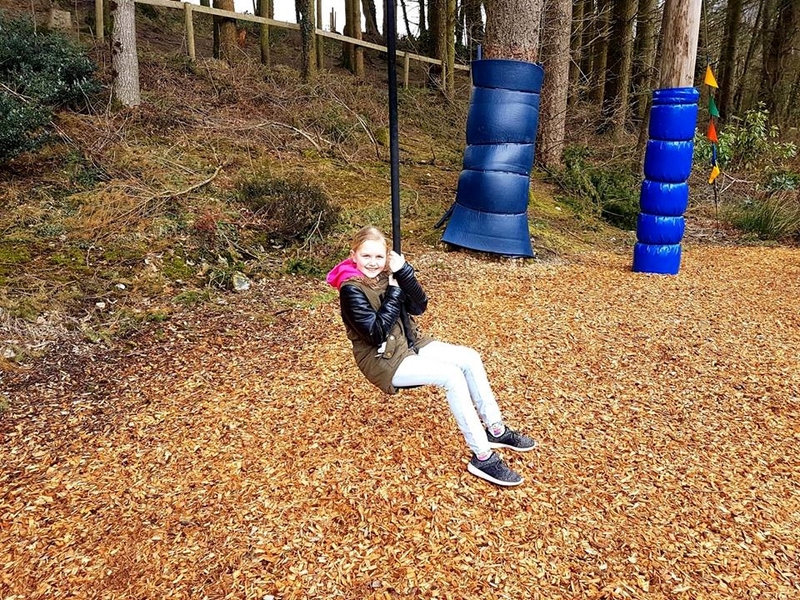 There is also plenty of seating and picnic benches available in this area, so it is the ideal place for parents to have a rest or enjoy a drink whilst the children play. Riley decided that this playground was still a little too big for him and so he went to the adjacent Tunnel Warren instead, which has been designed on a smaller scale for the under 7's. Again this features lots to enjoy with tunnels, slides and rope bridges. There is bench style seating all around this play area, but if you have children in both parks, then you can sit on the picnic benches that are located in the middle and that gives you a good view of both play areas. My children's favourite activity on this side of the park though, had to be the Great Green Run which is an awesome 70 metre sledge run, that is also the longest in North Wales. You simply pick up your sledge from the bottom of the track, carry it up to the starting point at the top of the hill and then ride at speed down the sledge run. Occasionally they spray water onto the run, which helps the sledges to run a little smoother and pick up some speed. 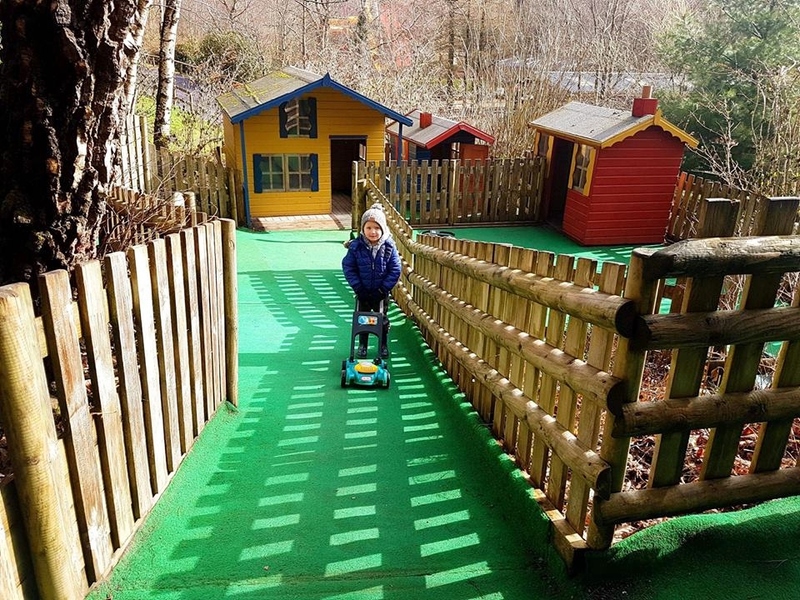 To ensure that smaller children don't miss out on the fun, they have also created a smaller version right next to it, called the Little Green Run and Riley absolutely loved this! I will be uploading a video very soon that shows this fantastic activity, so be sure to check back to this page shortly! We decided to make a stop at the cafe on our way over to the Solar Splash and we purchased some drinks and snacks. 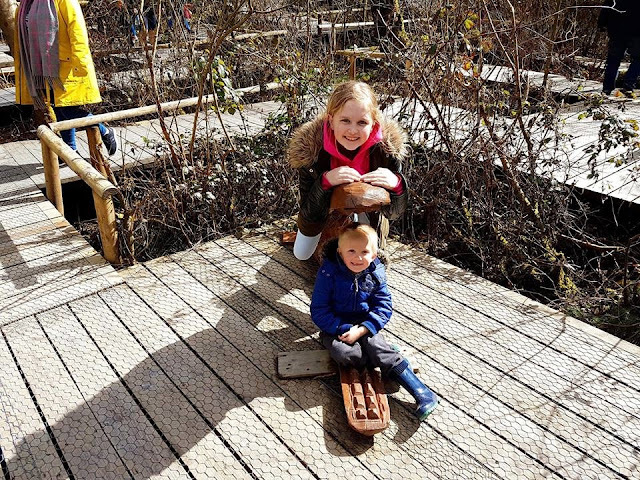 We had eaten a large cooked breakfast on our way to the attraction so none of us were hungry enough for lunch, however we did have a read through the menu and felt that there was plenty of choice for families, all at reasonable prices. The menu had a nice selection on offer, which varied from filled baguettes and jacket potatoes to burgers and snacks. The children also made use of the large indoor soft play area that is within the cafe whilst my husband and I enjoyed a coffee together. We sat in the attached conservatory area which was nice and warm with plenty of seating and tables. Everywhere seemed very clean and well maintained and we enjoyed a few moments peace whilst the children burnt off some more energy. 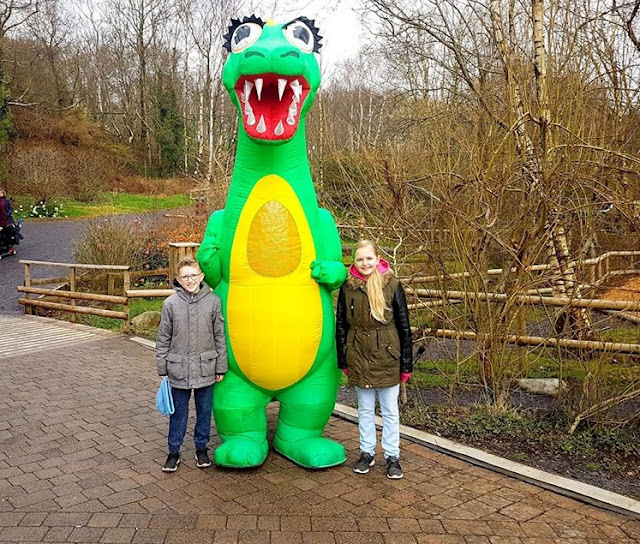 When they returned to the table, Ben quickly spotted a dragon mascot walking around outside and so we grabbed a quick photo! As keen as the children were to get to the Solar Splash area, we couldn't help but stop at the Magic Chair along the way. This clever trickery helps provide you with some fun photos with no photoshopping involved and the chair shrunk Emma much smaller than her five year old brother. Can you figure out how this is done? 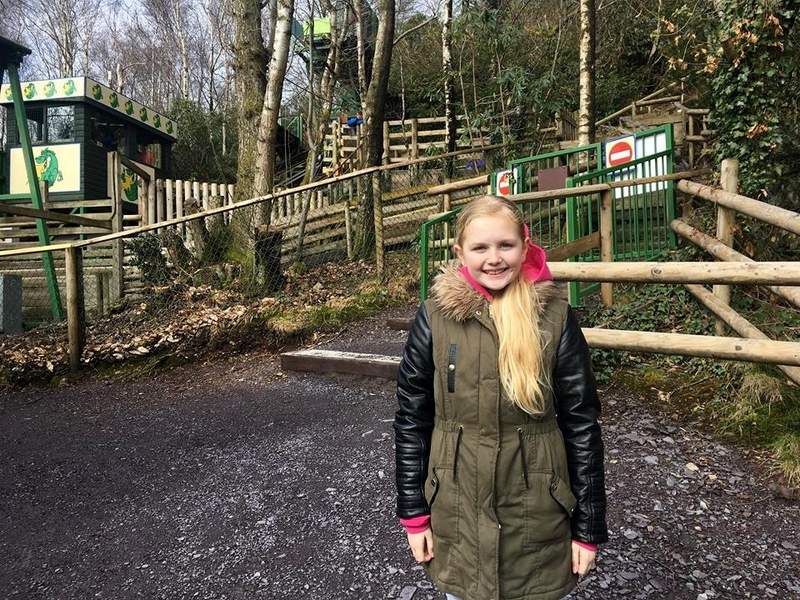 As we continued our walk around the attraction, we came across a new activity called Woodland Rovers, which is situated where the Donkey Rides used to be. These are a great idea and give children the opportunity to experience what it is like to drive their very own vehicle. 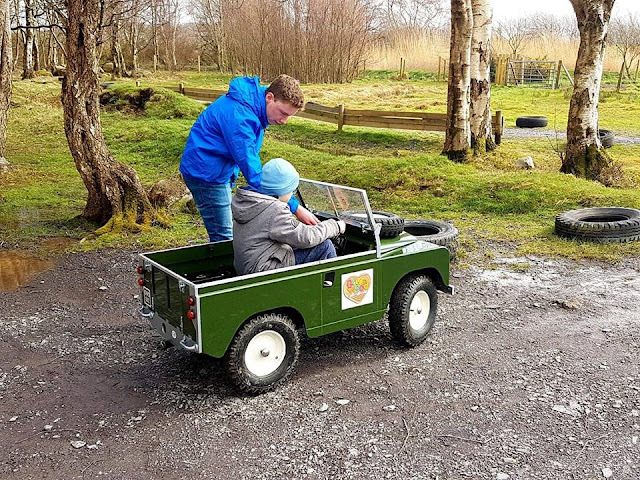 There is an additional charge of £2 per child to try this, but my son thought it was fantastic to get the chance to practice his driving skills and manoeuvre around the course, so we didn't mind paying this small fee. Situated near the Woodland Rovers, was also the Giant Jumper which is like a large bouncy pillow that children can jump up and down on together. Greenwood Forest Park have had the really good idea of offering specific toddler times for this activity too, so that little ones can enjoy a good bounce without the worry of being knocked into by larger children. Next to this was the Moonkarts, which all of my children remembered from our previous visit. Riley is still a little too small to pedal around the course by himself, but they have two seater passenger karts, so Emma happily volunteered to take him around the track. The Barefoot Trail was just slightly further down from the Moonkarts, which offers a barefoot sensory experience through different terrains including sand, bark and water. There are plenty of taps on standby for cleaning up afterwards, however we were so cold that I didn't want to even entertain the thought of taking my nice warm socks off, so we chose to give this activity a miss. Noticing that it was nearly time for Smarty Marty's show over in the Forest Theatre, we made our way back to the other side of the park via the Crocodile Maze. This activity tested my children's problem solving skills as we had to find the correct route. I particularly liked the fact that it was designed to be both pram and wheelchair friendly. Our last activity of the day was enjoying some comedy and magic with Smarty Marty in the theatre. There was plenty of seating for all the guests and the show was packed full of fun and laughs. There were lots of opportunities for audience participation too, with several children from the audience being invited up to enjoy some plate spinning! This was a really nice end to our day and we will definitely be returning again in the future. 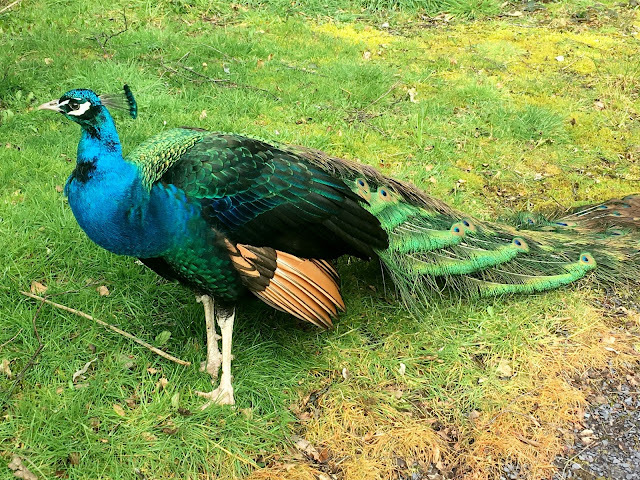 Overall Greenwood Forest Park is a wonderful day out for all fun loving families with a sense of adventure. There is plenty to see and do for guests of all ages and the majority of activities are suitable for all weather conditions. Despite spending a full day here, we ran out of time to try the Den Building, Jungle Boats and the Enchanted Barn, so a return visit is definitely on the cards for the summer. If I was to make any suggestions based on our visit, it would simply be to add the option to purchase a 2nd day ticket at a discounted price. I found that there was so much to do, it would be nice to spread it over two days and I know if we were camping or staying in the area, we would definitely take advantage of a two day ticket. The park is extremely environmentally friendly, well maintained and spotlessly clean throughout, making it an absolutely lovely place to be. 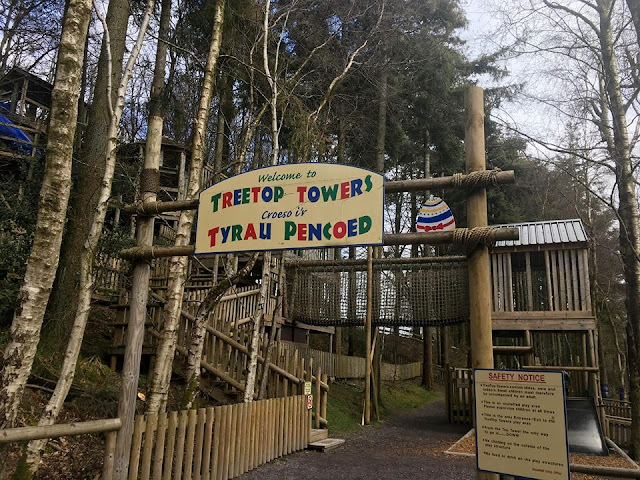 It is easy to see why this attraction has won the Family Attraction of the Year Award with The North Wales Chronicle for the 7th year running, as they really do provide a fantastic experience and great day out for all the family. Accessible by public transport: Yes, please see here for further details. Disclaimer: We were provided with complimentary tickets for the purpose of writing an honest review of our experience. All thoughts, opinions and photographs are my own unless otherwise stated. Attraction information is correct at time of writing, but is of course subject to change, so I would always recommend visiting the attractions own website to obtain the most up to date information.